This weekend on the wedding blog we are proud to support North East charity Willow Burn Hospice whilst giving you the chance to win your perfect wedding day. Willow Burn Hospice in Lanchester, County Durham, have come together with exclusive suppliers to offer an unbelievable wedding package worth more than £12,000. With generous support from Derwent Manor Hotel in Consett the winning couple can host their own unique wedding in March next year. The prize also includes flowers, cakes, cars, stationery, favours, suits and money towards a stunning gown and much, much more. Willow Burn Hospice is a registered charity (519659) that offers respite, day care and end of life care to adults from across Derwentside completely free of charge. Their aim is to ensure the dignity of each person that they care for, with excellent nursing care and dedicated staff. At Willow Burn they look after for the whole family, focussing on the wellbeing of everyone at life’s most difficult times. Nick Price, Operations Manager at Derwent Manor Hotel says: “We are extremely excited to support Willow Burn Hospice in their fantastic competition for a very worthwhile cause. We are delighted to help our local community and as we are a beautiful venue, set in 20 acres of Northumberland countryside overlooking the Derwent Valley, we are very proud to show the lucky competition winners how lucky they really are!”. Sara Kitchener of Sara’s Kitchen who is supplying either a 3-tier wedding cake or full dessert bar to the prize says: “I’m a strong believer in ‘paying it forward’ and I have been lucky enough to know a special lady who benefits from the work of Willow Burn. She helped me in the past, is a fantastic woman and I know the work of the hospice is very special – this is my way of ‘paying it forward’ and I’m really excited to be part of the competition”. Claire Chapman of The Glamorous Owl in Newcastle is donating a ring making workshop for the bride and groom as well as gifts for the Maid of Honour and Best Man and says: “There’s not many people now who haven’t been touched by cancer [or palliative conditions] and having worked as a nurse previously and held a ring making workshop for visitors to Willow Burn’s Day Hospice; I understand the need to continue their work – that’s why I’m taking part!”. 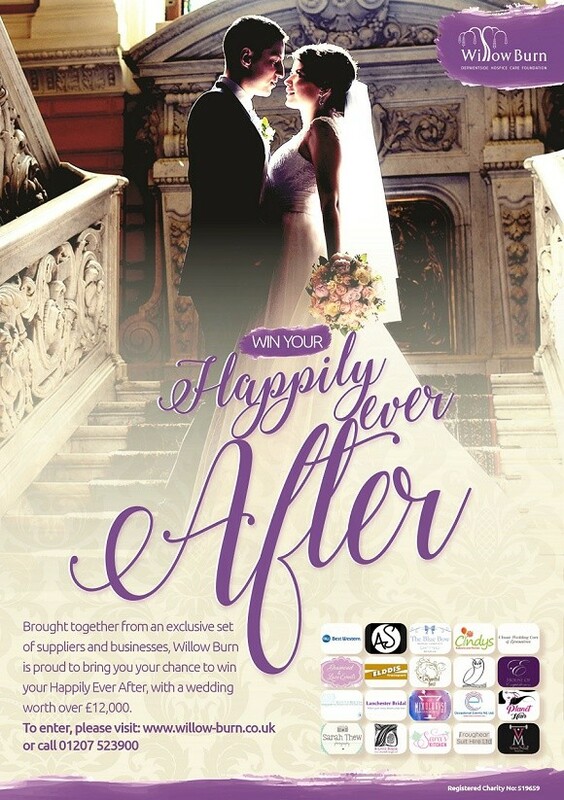 Win Your Happily Ever After from Willow Burn is a truly unique opportunity to win more than just a venue, dress and flowers – this competition gives the lucky couple everything down to favours and a party experience from cocktail master Dan Bowes aka ‘Mr Mixologist’; and bespoke stationery from Janette and Charlotte Noble from Silver Birch Designs. Dan says: “In nearly 3 years in business as Mr Mixologist I’m really excited to be supporting a competition like this – it’s a lot of fun and helps a great local cause!”. Janette from Silver Birch agrees and says “I’ve got a personal awareness of Willow Burn and hospice in general with links in my family but that’s why I know their work is so important and we’re thrilled to be part of the competition!”. Part of the big day for any blushing bride is looking and feeling great and personal trainer Victoria McFaull has generously donated 5 PT sessions to help her feel fabulous in her dress and photos. Victoria says “I’m originally from Moorside so I know Willow Burn as my ‘home charity’. I’ve worked with lots of different clients but weddings are a big thing to lots of people”. Neal of Classic Wedding Cars has offered use of any car from his extensive catalogue of stunning vintage vehicles for the special day in March. He says: “I’m happy to help with anything at all – we’ll even supply ribbons, flowers and bubbly for the passengers too!” Classic Wedding Cars have vehicles to suit all engaged couples styles – so we’ll be excited to see what the winners choose! With so much more in the package, hopeful couples are encouraged to visit Willow Burn’s website to learn more and enter! Closing date for entries is Friday 28th July and couples through to the next stage will be announced on 7th August. They then have 12 weeks to raise as much money as they can to support the work of Willow Burn Hospice – and have loads of fun doing it too! For more information please visit Willow Burn’s website or call 01207 523900.